A full-featured drilling system with automatic drilling (ROP, WOB, and SP), pit and pump monitoring, crown and floor savers, and more. Take your operation to the next step with our state-of-the-art drilling automation systems. Our DrillAssist™ product includes a full-featured auto-driller with WOB, ROP, and Standpipe Pressure modes. We also include standard Crown and Floor saver with a kinetic energy monitoring system in the block, all integrated into your drillers cabin, or we can provide the entire system packaged and ready to go. The M&I Electric DrillAssist™ is one of the most advanced and integrated Automatic Drilling & Traveling Block Safety Systems available today. 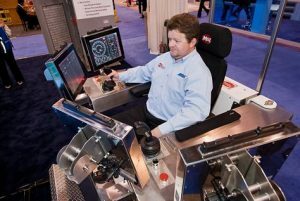 It utilizes PLC and touch screen control technology with software designed to optimize drilling control and drilling safety, complete with reliable sensors and control interfaces. Normal ready drilling functions carried out by the Driller can be performed by the DrillAssist™ with far more precision, consistency, and safety due to the fact that all related drilling variables are integrated and interacting simultaneously. 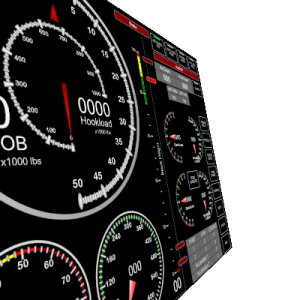 Our system includes all the hardware, sensors, and software to get your rig operating as smoothly as possible. Reduce the number of bits used during an operation with smooth WOB and ROP control. 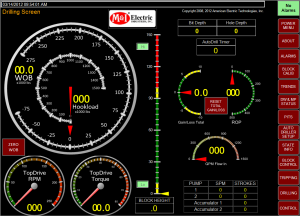 Directional drilling is much smoother with our Standpipe Pressure auto-drilling mode. Protect the crown and floor with our kinetic energy compensation system built into our joystick, the feature list goes on and on. If you would like more information about our DrillAssist™ system, including the Drill house, Drillers Chair, joystick control system, or any other part of our DrillAssist package, please feel free to contact us today.